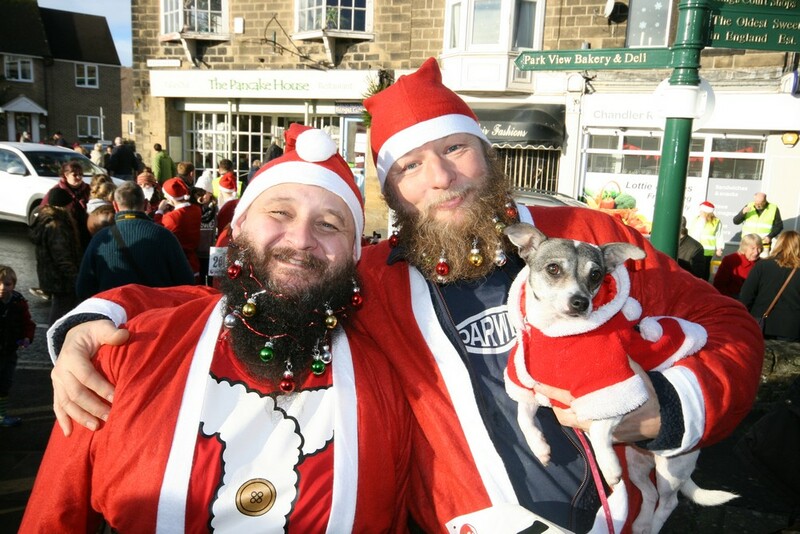 On Saturday 15th December 2017, Pateley Bridge held its very first Santa Extravaganza which raised £1400 for Dementia Forward – a registered charity based in Ripon. There were around 150 Santa’s walking down the High Street which was a sight to behold. The procession down the High Street was led by Rudolf high-fiving the crowds lining the sides of the street. Following Rudolph was a full-size sleigh with Santa. The sleigh team were courtesy of the Knaresborough Lions. Joining Santa in his sleigh was an elf and our prestigious VIP David Kerfoot MBE DL. Mr Kerfoot MBE commented that he has never been accompanied on his official duties by Santa before. Snow drifted across the High Street as well as the parade as it slowly proceeded down the High Street. A local shop proprietor commented t hat the crowds were as large as when the Tour de Yorkshire came down the High Street earlier in the year. 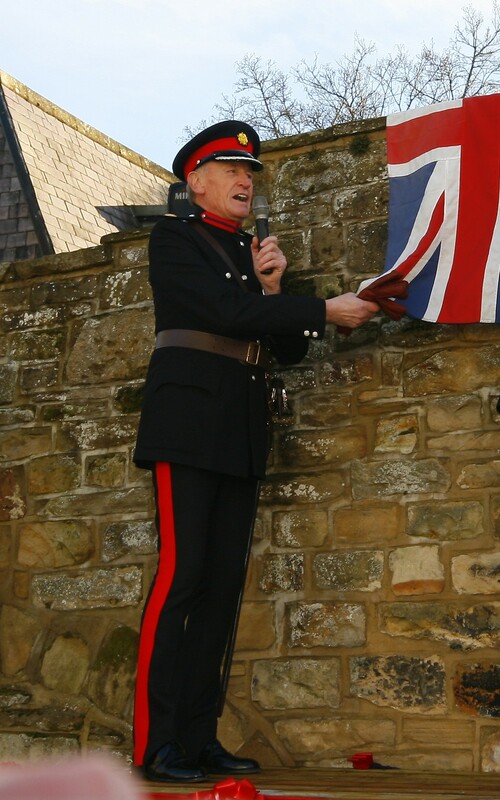 David Kerfoot MBE representing Her Majesty the Queen kindly honoured Pateley Bridge by unveiling the plaque Pateley Bridge won for the best High Street in the village category of the Great British High Street awards. The event was organised by the Nidderdale Chamber of Trade to raise money on the day for Dementia Forward – a local registered charity. Another memorable day in the history of Pateley Bridge. Keith Tordoff Chairman of the Nidderdale Chamber of Trade said. “Pateley Bridge won the title Best High Street in the village category of the Great British High Street Awards last year. I said at the time we would create a carnival atmosphere when unveiling the winners plaque. The Santa procession down the high street I believe successfully helped create on Saturday a carnival atmosphere. 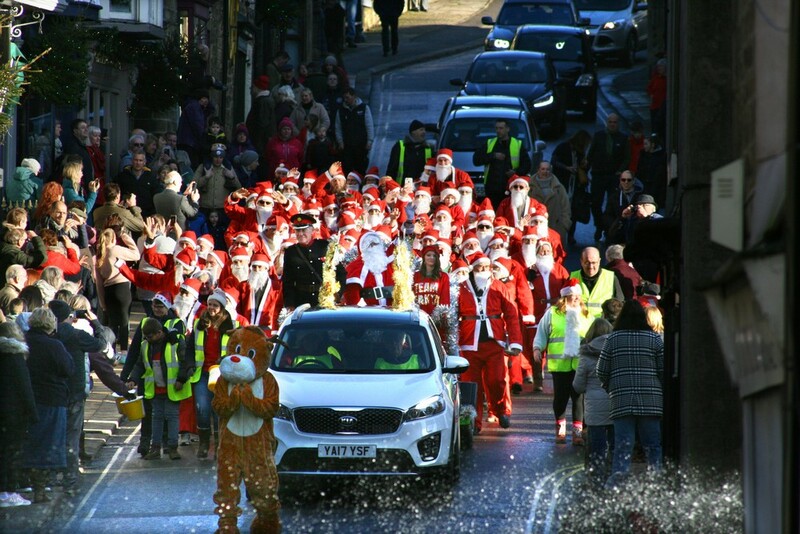 The sun shone, a full-size sleigh with Santa (and a Deputy Lord Lieutenant) 150 Santa’s in procession, snow drifting across the High Street and crowds flocked to Pateley. 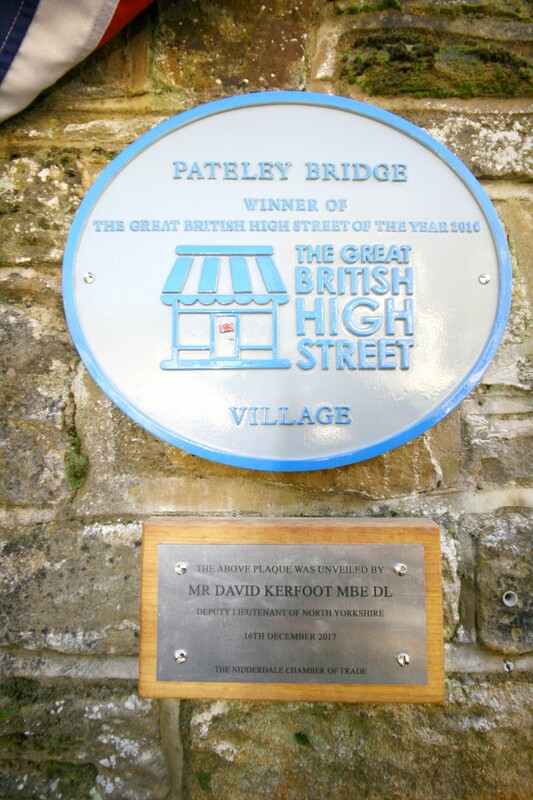 David Kerfoot MBE DL unveiled Pateley Bridge winners plaque. Around £1,400 was raised through the sale of Santa suits and donations on the day for Dementia Forward a local registered charity.